In Armstrong: The Adventurous Journey of a Mouse to the Moon by author-illustrator Torben Kuhlmann furry and meticulous little Armstrong stands on a stack of boxes and cartons each night, examining the moon through a gigantic high-powered telescope. Armstrong’s astute observations eventually lead him to the surprising conclusion that the moon is actually “a giant ball of stone” . . . a statement that doesn’t exactly sit well with his fellow mice, who prefer to continue believing that it is made of delicious cheese. Because a cheesy moon sounds better than a stony one, the other mice pretty much ignore Armstrong. He feels quite lonely and isolated until he discovers a mouse-sized letter from a wise old mouse who invites him to come and learn what he knows about the moon. Armstrong hops a freight car that whisks him to the old mouse and the old invention museum he lives in. There Armstrong listens to tales of mice that flew long ago, and this lesson inspires Armstrong to somehow go to the moon. 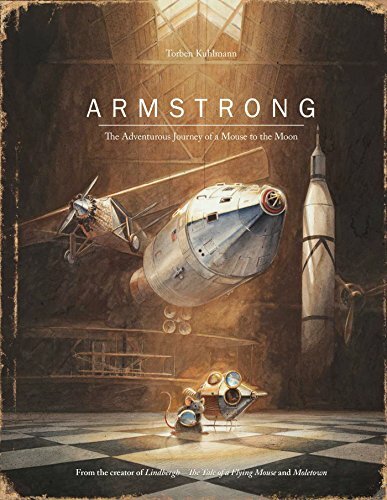 Following Old Mouse’s instructions, Armstrong studies human philosophy, visits college astronomy classes, and begins to experiment making a space helmet, a space suit, and even a space catapult that will shoot him to the moon. He has many successes, many failures, and many near misses, but he never allows anything to stop him from his goal. Eventually the persistent little mouse makes it to the moon and back and even leaves something behind to be remembered by. Armstrong is a sweeping, ambitious picture book that is poised to become a classroom favorite. Young and old readers alike will easily identify with Armstrong’s successes, failures, and steely resolve. They will marvel at his ingenuity, and they will learn from the way he breaks down the gigantic task of getting to the moon into minute steps that just may convince them that anything is possible if they put their mind to it. Picture book lovers will thrill at the exquisite details in this book. There are sweeping, richly-detailed illustrations of old-fashioned flying contraptions, crude space suits, teeny Armstrong gazing at the moon through a humongous telescope, and eventually, Armstrong planting his little mouse-with-wings flag on the moon for the astronauts to find. There is a very believable illustration of Armstrong sitting on a light fixture and listening to a college lecture about the moon; Armstrong at the drawing board, making meticulous notes; and Armstrong streaking through space in his flying contraption. Kuhlmann’s prose is as meticulous as Armstrong’s notes, but it is also peppered (or should that be grated) with chuckle-out-loud humor, like when Armstrong sits on a box of Parmesan cheese and wonders why none of his friends believe him, or like the insinuation that it is Armstrong the Mouse and not astronaut Neal Armstrong, who reached the moon first . . . only the world seems to have forgotten. Use this book for everything you can think of: in art lessons, history lessons, discussions on creativity and innovation, studies on why some people (or mice) think differently from everyone else; and the fact that everyone can achieve their goals, no matter how small or furry, if they only believe (and work and plan and experiment).